The adventure centers around the Brightblossom resort. It’s referred to as a “pleasure palace” but it’s not really a brothel but a swanky hotel with a library, observatory, hot baths, and fine dining. At least it was until a night hag showed up and eventually brought the whole place to ruin. The adventurers are called to explore the haunted mansion now known as the Blind Palace by a pair of nobles, the parents of Wilhelm Von Croft. Wilhelm had taken his adventuring friends and explored the estate a week prior, and much of the adventure will involve the PCs discovering their grizzly fates. One member of Wilhelm’s party survived, a bard named Katherine. She’s been struck mute by the hag, and has provided limited information, other than that Wilhelm and the rest died in the palace. The party are hired to break in and use a raise dead scroll to bring their son back to life. They have only 24 hours. It’s a hell of a plot hook, made even cooler by the addition of the manacled, haunted-eyed bard who can’t speak. Hopefully the party takes her along, and how they end up interacting with her (and she them) provides a lot of powerful emotional story-telling throughout. The dungeon itself is fairly straightforward and not terribly large – just how I like it. The courtyard features a carrion crawler fight and a well that hides a secret entrance into the bathhouse. Otherwise the party can waltz right into the main lobby and explore several different rooms. The office holds a friendly but oblivious ghast. The party can convince it that they are invited guests and he’ll hand over the keys, otherwise they’ll need to fight him and the skeletal guards. From there they can enter the observatory to fight a darkmantle, the library to chat with a ghost (and get a neat side quest), the aviary to avoid a trap and steal a treasure, the bath house to fight some zombies, and the music room to dance their way out of death. There’s a wonderful amount of variety condensed in a tightly packed area. 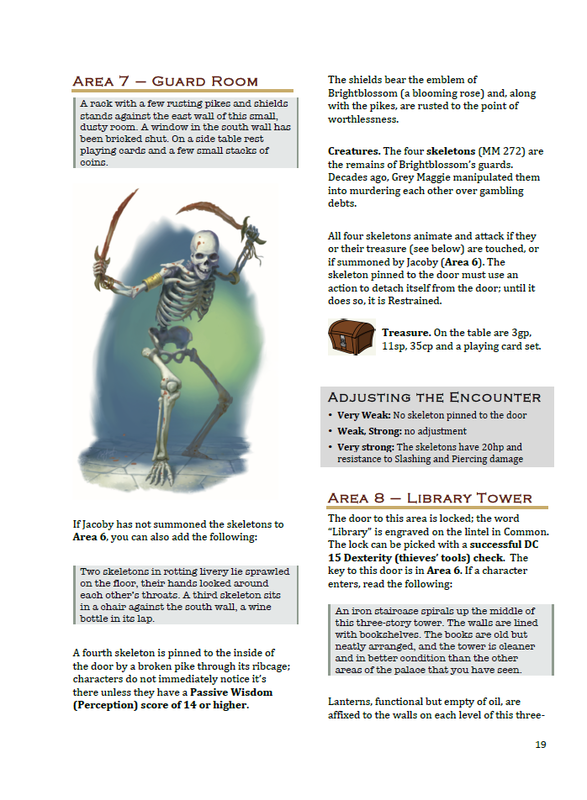 The combat encounters all include adjustments for stronger and weaker parties, scaling the adventure to around levels 1-4. It’s definitely not too combat-heavy, however. The music room’s encounter is particularly inventive and fun, as the party is tasked with a performance check or be possessed by the ghosts and forced to dance, gaining a level (or more) in exhaustion. Towards the back a ghostly scene plays out that shows Katherine inadvertently causing Wilhelm’s death via a Dissonant Whispers spell, and the party will have some interesting choices to make. She’s not a bad person, but she doesn’t want Wilhelm resurrected, lest he call for her immediate execution. And yet, the Night Hag has taken Katherine’s voice, and promised to return it if she lures more victims to her. If the PCs are particularly distrustful or mean to the bard, she will signal the hag to attack when they approach Wilhelm’s body at the end. The climax can play out in many different ways depending on how the PCs want to deal with Katherine and Wilhelm, and there are contingency plans provided by the author, such as animating parts of Wilhelm’s body as Crawling Claws and a Flameskull should they refuse to raise him, and having Katherine return as a Revenant if she’s put to death by Wilhelm’s parents or by the PCs themselves. I was completely enthralled with both the story-telling and design of the adventure. Separate player maps are provided, though unfortunately they are black and white only. In fact my only real complaint about the adventure is its physical presentation on plain white paper. But that doesn’t take away from this excellently memorable haunted house adventure. The mute bard and the mystery behind her doomed adventuring party serves as both a great plot hook and an interesting (and suitably terrifying) mystery to discover. The mansion contains a perfect balance of exploration, combat, and role-playing opportunities. Optional events and quests that can be completed to earn rewards, or in one case, avoid a nasty trap at the end. Every combat encounter has notes for adjusting for stronger/weaker parties and levels. Meaningful choice at the end with multiple layers and outcomes. No color on the maps. The Verdict: “Secrets of the Blind Palace” Is a fantastic haunted mansion adventure with a compelling hook, interesting NPCs, and memorable events.